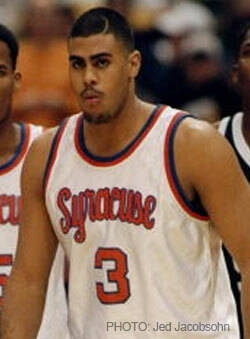 Charles Gelatt was a forward for Syracuse basketball for one season. Gelatt was a big bodied forward whose playing style was more similar to a small forward. Gelatt came to Syracuse with academic difficulties, and was almost redshirted his freshman year to help him focus on his studying. However, he did play his freshman year. He was a reserve behind sophomore John Wallace and junior Luke Jackson. As the season progressed, so did Wallace's game, which led to less playing time for Gelatt. Unhappy with his playing time and knowing that both starting forwards were returning, Gelatt would transfer after his freshman year . He would play at Barton County College (Kansas) in the 1994-1995 season, averaging 10.8 ppg and 7.5 rpg. He announced that he had signed a letter of intent to play for Iowa State in November for the following year, but in June 1995, he rescinded and said he was transferring to DePaul . Gelatt would play for DePaul for two seasons, the 1995-1996 and 1996-1997 seasons. He would play 10 games in 1995-1996 for the Blue Demons before being suspended for academic reasons. He averaged 4.0 ppg and 2.3 rpg in 17.7 minutes a game. His senior season he would start 15 games for the Blue Demons averaging 12.9 ppg and 7.0 rpg. He would then be suspended from the squad for the remainder of the season in February 1997 for violation of teams rules.